The iPhone has a pretty good clock, and it suits me just fine for most things. One thing I can say about it, though, is that it simply does what a clock is supposed to do. 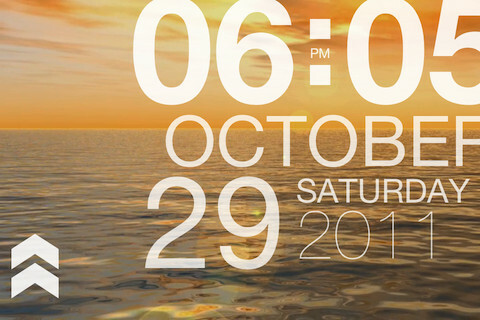 Now if you want a clock app that gives you a little eye candy and some, you might want to check out a new app on the App Store: vlock. With the tag line that “it might just be the most beautiful clock on a phone”, one can’t help but get interested, yes? It works with the iPhone, iPad, and iPod Touch. vlock is all about background videos that are totally mesmerizing. For some reason, I am reminded of the visual effects that are used for music players. Yes, I have found myself simply staring at them for longer than is necessary. Right now, vlock is free for everyone to download. Of course, nothing in life is for free anymore, so you have to pay for in-app purchases. The good news is that the wallpapers are marked down. You won’t even think twice of getting them!